When it comes to finding the best smartwatch in the market, Android and Apple watches tops the chart. To some extent, Samsung and their Tizen-powered wearable also prove their worth. Besides this, there are many third-party manufacturers that make their presence felt by offering great value to users. Let’s have a look at a smartwatch that is known to offer premium features with not so special price. Here comes Ticwatch 2. Though it is said that it has some unique features, there is a lot that is pretty much common. First, it is a display-centric watch with its 1.4-inch OLED display that forms the major part of the watch. There are various variants but we assessed the Oak edition. It boasts of a stainless steel build and a graceful brown leather band that fits perfectly into the typical 20mm lugs on either side of the body. There is a heart rate sensor on the back side that can be used as per one’s own preferences. You won’t find any charging ports as it features wireless charging with two charging docks. You may find that the crown is on a different side than other smartwatches. The reason behind its left side positioning is due to the presence of touch-sensitive area on the right that keeps it enabled for ‘tickling.’ Though it is not very much functional and prompt, one can get used to it after trying for several times. One distinctive aspect of Ticwatch is its weight which is low as compared to its counterparts. Here it is important to note that this is the sporty version that comes at a decent price. It has an appealing and big display. Its 1.4-inch OLED display comes in 400×400 resolution that is enough for a smartwatch and delivers superior clarity in all conditions. Though you may notice a bit of slackness, its Ambient Display mode is impressive and makes text reading easy. As far as battery is concerned, it certainly lacks the juice. It comes with 300 mAh unit that is relatively lower than other smartwatches available in the similar domain. Due to this, it can last up to a day and a half without enabling Ambient Display and minimum notifications. On the performance front, the watch is pretty much smooth and easy. Though you won’t get superfast promptness, overall it is good when it comes to navigation and notifications. However, you may complain about low space that would restrict you from installing more apps. This is one area where more testing and expansion is required. If you love listening to music, its 4 GB of RAM would never disappoint you. 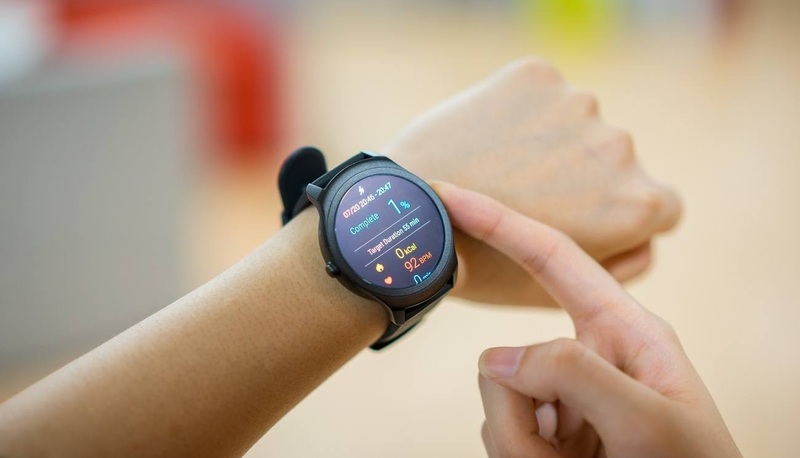 You can use the GPS primarily for fitness tracking apps and it works in association with pedometer and the heart rate sensor to deliver information during and after workouts. The software used in the watch is named Tickwear. Available on Play Store, it is easy to use as you can connect it with the phone just like other smartwatches. Against a decent price tag, Ticwatch 2 is a good buy.